Being stuck in the middle is often a bad thing. But what if you’re not stuck? What if, instead, you’re the key part of the operation? A distributor, for example, would likely be in the driver’s seat, capable of straddling manufacturers and customers and calling the shots to their strategic benefit if they can be key part of the operation. The stuck distributor, on the other hand, probably has fewer options and is at risk of being marginalized or, even worse, being squeezed out of the supply chain altogether. IBM’s Guy Blissett, author of the tenth edition of Facing the Forces of Change (a publication of the NAW Institute for Distribution Excellence), recently told an audience of distributors that they must innovate now or risk becoming obsolete. “For a variety of reasons, distributors are thinking about who they are, what they want to do, what value they bring to their customers, and how they want to differentiate themselves,” said Blissett. Whose job is it to look for customer buying patterns that show preference, fatigue and transition? It’s easy to say that it’s the manufacturer’s or supplier’s job, but it’s more forward-thinking to say that anyone in the supply chain can own this. Perhaps even you. Information on what’s selling well, what’s not and what might be trending is as valuable as hard currency. You can use it to buy access to new partners or new markets, to elevate your standing with existing partners in your supply chain or you can simply apply it toward making your own business more efficient and profitable. Perhaps a simple example can bring this home. Let’s say you want to provide better suggestions to your customers and increase your purchasing level with a supplier to take better advantage of pricing breaks. 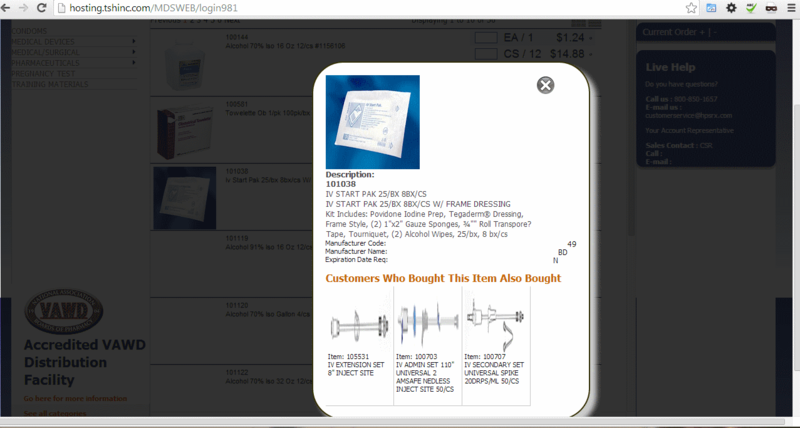 Using our MDS-NX Remotenet Suggested Items feature you can easily identify items ordered together and recognize a trend. An idea soon emerges: what if the manufacturer packaged the two items, named the bundle and added a special price? Imagine the response from customers and suppliers. If the supplier doesn't see the value of creating the bundled item, you can create it yourself. Customers will not easily switch to a competitor when they cannot get the same item in the same packaging.. This is just one example of adding value by simply having access to information. Information flows freely throughout your company, but consolidating and deriving insights from that data isn’t as easy as it seems. But that’s changing. Today, thanks to barcodes, tablets and even smartphones, we can capture so much more in digital format than ever before. And with a little extra work, you can go almost completely paperless. When you reach that point, you’re able to do things within your supply chain that make partners happy, lower operational costs and increase margins. Pressure to keep costs down and demonstrate value to partners is never-ending. Face it, if there’s any chance of dropping you – or, equally disconcerting, channeling less business your way, manufacturers and suppliers will do so. And, even if you’re able to fight for your survival, it’s likely you’ll lose anyway if you start offering incentives, promises or extras that your business’ numbers won’t support. Once you’re in a margin death spiral, the only way out is to make decisions with near perfect information. Information offers infinite possibilities. You can discover things about your business each day that drive greater efficiency or increased profits, but the impetus for becoming more data-driven can be as simple as providing better service. Large businesses have spent decades investing in customer relationship management (CRM), but it’s as much a change in business philosophy as it is technology. Understand your data and you will understand your customer. Automation and integration aren’t ends, they are means. Once you implement technology, the hard part is adapting your organization, including your extended supply chain, to capitalize the insights. And capitalize you must, because your customers have a very different expectation today than a decade ago. Our experiences as consumers – speed, self-service, loyalty discounts, expedited shipping, etc. – changes what we expect for our business relationships. And the dramatic evolution that’s taken place in the consumer realm was data-driven. So, it stands to reason, data is rapidly transforming this industry. So it’s data, not technology, that’s transformational. And, thanks to decades of tinkering with complex technology platforms such as ERP and CRM, much of the kinks, as it were, have been smoothed out. And with the recent explosion of cloud technology, the barriers to technology adoption have never been lower. Even the smallest distributor can become a data-driven enterprise by simply clicking a button.Fortunately, you and your employees don’t need to learn the cloud. That’s just an information superhighway and online bank (for data withdrawals) rolled into one. The technology that makes it easy to collect, store, and draw insights from data isn’t hard to learn either. And all of this is possible without expensive capital expenditure, space and expertise to operate. All you must do is commit to use readily accessible data as a way to become more deeply entrenched in your existing supply chain, prove yourself to be a key part of the solution.